‘Young bloods’ are always misunderstood and unappreciated by the societies they live in. That is because they talk and do things outside the frame set for them by their elders. Yet, it is these ‘young bloods’ that change societies by questioning the validity of the accepted views. Be it politics, art, religion or culture, revolutionary changes in all these areas have been instigated by young people who think differently. World history is replete with examples that support this generalisation. An example proving its validity relating to Sri Lanka has been narrated in detail by another such young blood, Dinesh Weerakkody, in his latest book, ‘The Great November Revolution’ released in Colombo last week. Dinesh Weerakkody, a private sector managerial expert with an MBA from the UK’s University of Leicester, was noted well for things other than politics. 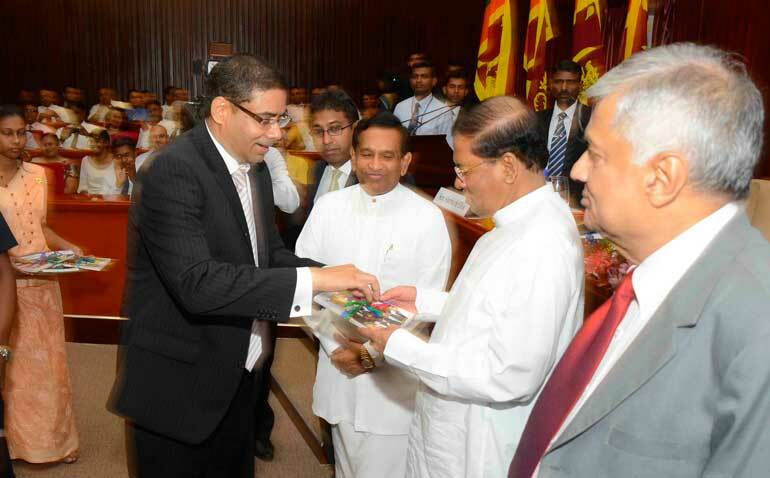 He was the youngest chairperson of the largest private commercial bank in Sri Lanka. He is a writer and columnist taken to that art from a relatively young age. He published a collection of articles in a book titled ‘In the Interest of My Country’ in 2013. This writer had the opportunity to review it earlier (available at: http://www.ft.lk/article/195236/Dinesh-Weerakkody-s-dream--May-it-be--In-the-Best-Interest-of-My-Country- ). In this background, politics is the least known aspect of his life though he has admitted that his sympathies have been with the United National Party and loyalty to its incumbent leader. It is this unknown side of his personality that had drawn him to a group of like-minded young bloods that strategised and executed a risky plan to change the course of Sri Lanka’s recent political history. It was a daring attempt which only a bunch of reckless young people would consider putting into action. That was because their adversary was the most ruthless authoritarian regime in Sri Lanka’s recent history. The regime had proved more than once that it would not tolerate even the slightest opposition to its right to rule with kindness. The stakes were, therefore, well known beforehand. If you fail, you have to find a country willing to accept you as a refugee for the rest of your life. That even, if you are successful in fleeing the country in time. If you are caught, either you disappear without a trace or languish in dungeons cursing the society that has failed to support your cause. Despite these odds, they tried and succeeded in their high risk enterprise. It is this success story which Dinesh Weerakkody has narrated step by step in his recent book. He has been assisted by an apt editor, the veteran senior journalist Paneetha Ameresekere, to put his story in a reader-friendly language. Thus, the book is like an Agatha Christie novel with suspense and excitement throughout capturing the reader’s attention from beginning to end. The Mahinda Rajapaksa regime that came to power in 2005 managed to end the 30-year-long ethnic war in 2009 with a resolute victory for the Government. Weerakkody too gives credit to Rajapaksa on this count. Almost all those in the plot against his rule in the current case were his supporters at his previous election to presidency in 2010. They all had supported him at the election in the expectation that he would usher in a new era to the country. In fact, he was in a position to do so with the massive support he had got from the people at the election. But within years, the plotters say that they all got disillusioned about his rule, his ambition, his governance, his ethics and so on. On every count, Mahinda Rajapaksa was not the man they expected to be their ruler. His rule, therefore, divided the people into four groups: those who hero-worshipped him, those who supported him in exchange of numerous economic benefits, those who were disillusioned and those who were opposed to him. Within a few years, the first two groups began to crimp, while the last two groups began to swell. Unfortunately, Mahinda Rajapaksa could not read the emerging developments in the country. That was because he began to believe in the lies he and his supporters had been spreading in the country that he was an invincible deity. In this background, an idea seemed to have sprung up in the minds of a few young bloods that had supported him at the elections but disillusioned about his rule. It is in fact ideas that change the course of history and not the lethal weapons which mortal men bear. Nearly 2,600 years ago, the Buddha revolutionised the spiritual world by coming up with a novel idea called ‘The Law of Impermanent Soul’. Its effect is still felt in many parts of the world and will continue to do so for many more years. In the modern times, the power of ideas was put cogently by the 20th Century’s most influential economist, John Maynard Keynes, in the concluding part of his path-breaking treaties, ‘The General Theory’. Madmen in authority know of this danger. That is why they take all measures to suppress the independent ideas of citizens. But history has proved that they always fail because independent ideas are more powerful. This was exactly what happened to Mahinda Rajapaksa regime too. According to Dinesh Weerakkody, two young bloods got a strange idea when they met at the University of Cambridge in the UK in 2013. One was Dr. Kapila Ranasinghe, an expatriate Sri Lankan who had studied at both Harvard and Cambridge, and taught strategy to many generations of students worldwide. The other was Chatura Senaratne, son of Minister Rajitha Senaratne and now an MP representing the Gampaha District on the UNP ticket. Both of them came to the single conclusion that the toppling should be done from within the regime and not from outside. It was too dangerous to try it from outside because the regime had all the powers and weapons to nip it in the bud. The regime could portray it as a coup funded by Western enemies and justify its suppressive moves. It had a notorious intelligence service which was watching suspected citizens, tapping their telephones, following them wherever they moved and logging into even their private email accounts. Hence, without their knowing it, not even a bird could fly in the skies of Sri Lanka. The regime was very confident about its ability to take pre-emptive action even if someone spoke in private against the Government. It appeared that that overconfidence was its Achilles’ heel which the young bloods working against the Government could use to their advantage. They were able to operate below the Government’s radar system without being seen, heard or watched. Naturally, the radars of the intelligence services did not display them on the screen because they were just youngsters from within the group and therefore not worthy of being followed or watched. Soon, they had the advantage of examining a report prepared by another young blood, Malith Jayathileke, a national list MP today but an advisor to Minister Dulles Alahapperuma at that time. Jayathileke had done his Master’s degree in social sciences from a leading university in India and was well versed in survey methods and statistics. He made an electorate-wise elaborative study of the voting pattern in the last few elections. His study led him to the conclusion that Mahinda Rajapaksa could not get sufficient votes from the Sinhala Buddhist vote base in the southern part of the country to win a presidential election given the fact that he would not be favoured by minorities. To win, Rajapaksa should get at least 70% of the votes from the Sinhala Buddhist voters but it was unlikely in view of the erosion of his vote base over the years. Dinesh Weerakkody says that Malith Jayathileke’s objective was not to topple the Rajapaksa Government but to pre-warn it that it has to change its strategy and course. But instead of welcoming the report, says Weerakkody, he was accused of being a saboteur by Rajapaksa brothers who were very powerful at that time. One cannot blame them because they were very confident of their strength based on the false reports filed by their own reporting agencies. Thus, Rajapaksa lost a valuable opportunity. But it was a treasure for the young bloods that were planning to topple the regime from within. It gave them confidence that they could succeed in their enterprise if they worked tirelessly with correct strategies. It was at this point that Dinesh Weerakkody joined the club. The young bloods then started to recruit civil society leaders and politicians of worth surreptitiously to their cause. The list is long but includes Ven. Maduluwawe Sobhitha, Ven. Aturaliye Ratana, Patalee Champika Ranawaka, Rajitha Senaratne, Chandrika Bandaranaike Kumaratunga and finally Ranil Wickremesinghe. Dinesh Weerakkody functioned as the conduit between Ranil Wickremesinghe and the rest of the group. It was easy for all of them to join together because they had been watching with concern the deterioration of the country economically, politically, socially and internationally under Mahinda Rajapaksa who had enormous promise in 2010 when he was elected President for the second term but failed since then. Weerakkody explains that they all had to work in utmost secrecy without being nabbed by intelligence services. Hence, midnight meetings were held in different locations, face to face communications were conducted instead of using telephones and pieces of notes were exchanged instead of emails. All these were done to operate below the radar system of the intelligence services. People were kept informed only a ‘need-to-know’ basis. Even Weerakkody’s wife did not know where he was going in the middle of the night in different vehicles. Weerakkody says that it bothered her much keeping her awake till he returned home in the early hours of the morning. The roping-in of Maithripala Sirisena as the common candidate was done by Rajitha Senaratne on the instructions of Chandrika Bandaranaike Kumaratunga, according to Dinesh Weerakkody. The process had started only three to four months before he actually appeared in public in November 2014. Weerakkody has dramatised the first approach by saying that it had happened at a wedding ceremony at which the all powerful Defence Secretary Gotabaya Rajapaksa too was present. 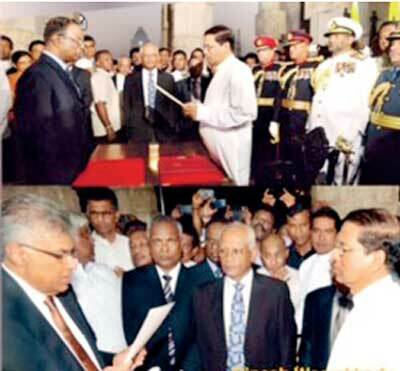 Rajitha, Gotabaya and Maithripala had been seated at the same table and the loud music in the wedding hall had given total privacy to Rajitha to converse with Maithripala without being heard by Gotabaya. This initial approach had been followed at a subsequent public meeting at Polonnaruwa to get Maithripala Sirisena’s consent to come forward as the common candidate against Mahinda Rajapaksa. According to the narration of Dinesh Weerakkody, Ranil Wickremesinghe, another strategist par excellence, had mobilised all the forces against Mahinda Rajapaksa to end his rule in January 2015. What happened thereafter is well known. Dinesh Weerakkody’s book is the inside story of some young people strategising to topple the most ruthless regime in Sri Lanka. The project was later taken over by top level politicians in the country who only could take it to a successful conclusion. But the idea and the strategy to be followed came from these young people. It also teaches a good lesson to the current as well as future administrations of the country. That is, securing Parliamentary majority even at a two-third level will not guarantee the stability or the continuity of any administration. 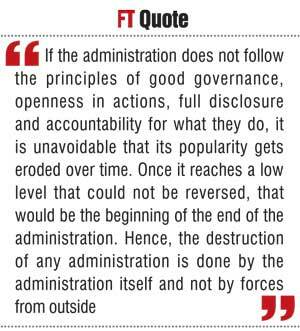 If the administration does not follow the principles of good governance, openness in actions, full disclosure and accountability for what they do, it is unavoidable that its popularity gets eroded over time. Once it reaches a low level that could not be reversed, that would be the beginning of the end of the administration. Hence, the destruction of any administration is done by the administration itself and not by forces from outside. This should be an eye-opener to the current government which has come to power on the promise of good governance, a clean society, listening to the people and full accountability for what it does. Made up of different species of diverse political complexions, it is specifically vulnerable to such implosions. Dinesh Weerakkody has done a service to his fellow citizens by unfolding the secrets that had shrouded the whole story of toppling the Rajapaksa Administration. He has not named any hero in his book. He himself has not tried to be a hero. But all those people whose names were mentioned above have been heroes. Of them, the real heroes had been the young bloods that felt the necessity for a regime change and then actually strategised to attain that objective. The lesson to be learned is that no one should underestimate the power of ideas and especially when those ideas come from young people who are willing to act on them. Dinesh Weerakkody’s ‘The Great November Revolution’ is a must read. However, to make it available to a wider readership, it is suggested that it be translated into both Sinhala and Tamil promptly.